The Maxlite RR61530W comes at 14 watts and 825 lumens output. 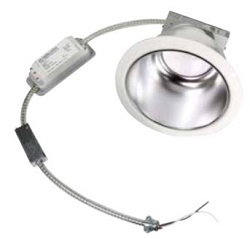 The model is 6 " and compatiable for dimming. This fixtures is design for general indoor lighting in residential, office, retail, restaurant, school, hospital, hotel/motel locations, commercial atriums, and living room. There is a 5 year warranty for this item.